Academy Award-winning actress Halle Berry has joined forces with the Callaway Golf Foundation and the Entertainment Industry Foundation as the 2008 ambassador for the Callaway Golf Foundation Women’s Cancer Initiative. Berry will be featured in an extensive print public service announcement campaign this summer aimed at raising awareness and funds to help find a cure for ovarian cancer. Ovarian cancer afflicts more than 22,000 women in the United States each year and claims the lives of more than 15,000. "As a daughter and a new mother, I was shocked to learn the facts about ovarian cancer," said Berry. "That’s why I’ve teamed with the Callaway Golf Foundation and the Entertainment Industry Foundation to educate women about taking care of their health." Visit the Callaway Golf Foundation for more info, including how to get involved and how to make a donation. This is one of the photos resulting from Seema Sadekar's shoot for her new sponsor VTech Communications. VTech sponsors several other women golfers, too, including Christina Kim, Becky Morgan, Amy Hung and Alena Sharp. We'll share some more photos of Seema from this shoot in the future. As a result of her Order of Merit finish, Seema earned a spot in the field at the 2008 LPGA Canadian Women's Open in August. Chris has non-exempt status on the LPGA Tour in 2008, her rookie season. That status has gotten her into just four LPGA events thus far, but she's made the cut in two of them. She took up golf at age 2, and must have started tennis around that time, too, because by age 12 she was a two-time Georgia state tennis champion in her age bracket. In addition to golf and tennis, Chris was recruited to play college basketball, and her LPGA bio says her hobbies include "slalom skiing, tennis, basketball, track, jetskiing, snowboarding and watching baseball." Makes me tired just reading it. In golf, Chris won the 2000 North Carolina high school championship, the 2002 North Carolina Women's Amateur, was a 5-time winner in college and a 3-time All-SEC selection. Chris turned pro in 2007, and when not competing on the LPGA can also be seen on the Futures Tour. We wrap up our series on the women of "Highway 18" with Charlotte Campbell. Don't forget - the series debuts tonight (July 22) at 10 p.m. ET on the Golf Channel, and will air for nine more episodes in the same Tuesday night timeslot. Charlotte was a dominant player at NCAA Division II Rollins, where she won 10 tournaments during her career, including back-to-back victories at the NCAA Division II National Championship tournament (2003-04). She was the NCAA Division II Player of the Year all four years at Rollins (2003-06), and Rollins won the team title all four of Charlotte's year. Yep, that's dominating. Charlotte is teamed with her brother, Rob, for "Highway 18." The Campbells are Floridians, with Charlotte currently residing in Heathrow. Charlotte currently competes on the Futures Tour, where her rookie season was 2007. As with most golfers playing the Futures Tour, expenses require almost as much attention as golf. But Charlotte has come up with a way to help offset her expenses, and you can easily help her develop her fledgling career. 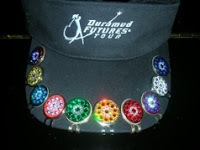 Charlotte makes Swarovski ball marks (for the fellas - at least the ones as cloistered as me - Swarovski is a type of crystal) in a rainbow of colors - the type of ball marks you clip onto your cap, as is very popular on the LPGA Tour. She calls them "Blingo" ball marks. If you want to buy some Blingo - use one yourself, buy a few as gifts, or inquire about corporate or bulk orders - check the Blingo Web site. Any money you spend will be helping Charlotte pursue her career. We continue our series on the women of "Highway 18," the Golf Channel series that debuts at 10 p.m. ET on July 22, with Jameica Duncombe. Duncombe, age 25, is a native of the Bahamas who currently lives in Coconut Creek, Fla., and plays out of Bonaventure Country Club. A marketing professional and a golf professional, Jameica is the daughter of a teaching professional. Her father, in fact, taught for many years alongside the individual Jameica is paired with in "Highway 18." She started playing golf at 3, and competed in her first event at 5. By her 10th birthday, she won her first of seven Bahamian Junior Amateur tournaments and first of nine Bahamian Women's Amateur events. Jameica left the Bahamas at 14 to attend the Arnold Palmer Golf Academy in Tampa, Fla., and became a two-time, All-North Suncoast Player of the Year her junior and senior years of high school. She attended the University of South Florida on a full golf scholarship, where she was an All-Regional NCAA selection her sophomore year. Following graduation, she won the Caribbean Amateur Championship in 2003 and competed for two years on the Duramed Futures Tour. Currently, she works in the golf marketing department for the Bahamas Tourism Board. The partner of Ashley Davis (featured in the previous post) on the Golf Channel's "Highway 18," Ashleigh Korzack is also a Toronto native. She currently lives in Starkville, Miss., where she is a grad student at Mississippi State University and plays out of Old Waverly. Korzack was a competitive volleyball player for several years, in addition to her pursuit of golf. That was a pursuit that began late: Korzack didn't take up golf until her junior year of high school. But she learned so quickly that she wound up earning a golf scholarship to Mississippi State. Ashley Davis is one-half of the "Ash & Ash" team on the Golf Channel's "Highway 18," which debuts on July 22. Ashley Davis, pictured here, and Ashleigh Korzack (still to come in our "Highway 18" series) are longtime friends who grew up together in Toronto, and like to play the "ditsy blonde" part. But they are just playing. Davis began her collegiate career at Tennessee State before finishing it at Old Dominion. 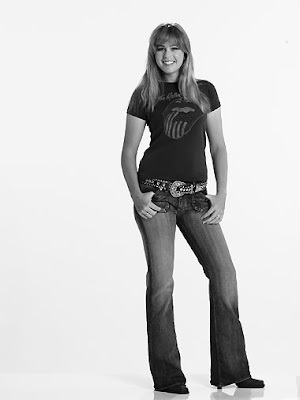 She now works in business development for the United States Olympic Committee in Colorado Springs. Davis comes from a family of athletes. Her father was a three-time All-America golfer at Ohio State University, and her grandfather, Frank Davis, is a member of the Hockey Hall of Fame. This is the first of a series of posts we'll be doing this week on the women of "Highway 18," the Golf Channel series that debuts on July 22 and will air on Tuesdays for 10 episodes. 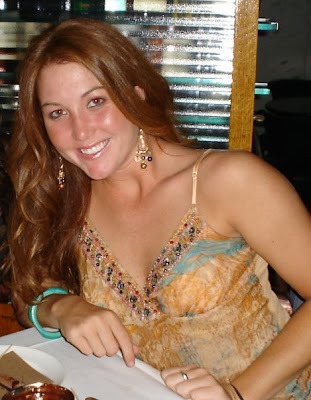 Readers of Golf Babes are familiar with Keri Murphy as the very likable, very charming video host for GolfNow.tv. Hmmm, charming and likable ... could those qualities be the reasons the Golf Channel chose Keri to host "Highway 18"? "It was such an awesome experience," Keri said of her first assignment with the network. "The Golf Channel was looking for a new face for the show and while doing some research found me on the golfnow.tv site." "Gorgeous" probably didn't hurt Keri's audition, either. Murphy has a long background in modeling. A two-time Miss Oregon contestant, she now runs her own agency, Wilhelmina MTG, in Portland, Oregon. Keri has also spent quite a bit of time in front of the camera, acting in regional and national commercials and independent films. She also owns an actors' studio in Portland called The Lime Lab. Her blooper clips from GolfNow are very popular on YouTube and even played a role in Keri landing the "Highway 18" hosting job. "One of the producers, James Ponti, said he loved my bloopers and could tell I would not be a 'diva' to work with," she said. "If he only knew ... (just kidding!)" Keri will also be appearing in an MTV modeling series later this year, and is heavily involved in charitable work, as well. "We had a great time taping the show. I really hope I get to continue to work on the show and the with the Golf Channel." Way low. All the way down to 60 low. Paula Creamer's first-round score in the 2008 Jamie Farr Owens Corning Classic was 11-under 60, a score reached (or bettered) only four times previously in LPGA Tour history. Here's the list. Congratulations to Kim Welch for winning "Big Break: Kaanapali." Kim defeated Sophie Sandolo, 4 and 3, in the championship match that aired this week. Now Kim can finally stop holding it in, and publicly celebrate. Kim has two Top 10 finishes on the Futures Tour so far in 2008, including a runner-up. At the time of this writing, she ranks 11th on the money list. Her scoring average continues to drop, too. Her scoring average in 2007 was a stroke lower than in her rookie year of 2006; so far this year, it is a stroke lower than it was in 2007. Watch for Kim in the Navistar LPGA Classic coming up in September. Jane Park didn't win the P&G Beauty NW Arkansas Championship - but she came this close after starting the final round tied for 32nd, eight strokes off the lead. She wound up tied for second after shooting a 62 that included 10 birdies. That's a new career-low round for Jane, her secoind runner-up finish of 2008 and fourth Top 10 of the year. Jane also recently announced that she would donate a portion of her winnings from each tournament to the Michael J. Fox Foundation, which helps fund research into Parkinson's disease. Sandra Gal is another of the "Wilhelmina 7" golfers, the group of LPGA Tour players signed by Wilhelmina Artist Management, a division of Wilhelmina Models. Gal is in her rookie season on the LPGA Tour in 2008 after qualifying through Q-School. She's had five Top 25 finishes so far in Year 1, and has already earned enough to secure her tour card again for 2009.